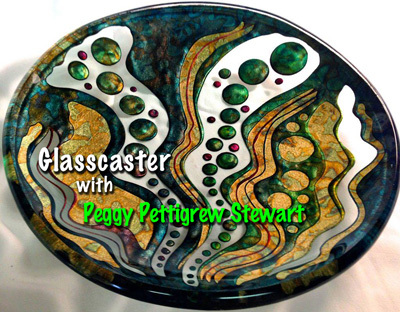 Join us in this free podcast as we take a look into the incredible world of Peggy Pettigrew Stewart. Her work with fused glass, kiln casting and Verre Eglomise has brought some phenomenal glass art to life. We discuss her current project, casting the faces of some of rock-n-roll's greatest legends in glass. Focusing on the San Francisco Bay bands during the Summer of Love, she's cast the faces of Janis Joplin's band- Big Brother and the Holding Company, Country Joe McDonald, and members of the Jefferson Airplane and Santana. These complex castings each take several painstaking months to complete, and they are all a labor of love. There are many more stars to immortalize, and Peggy shares her concepts and methods in this insightful Interview. Rock on.